A few weeks ago I received Melissa Lanz’s book The Fresh 20 in the mail. The book features a series of weeknight meal plans, by season, each with 20 ingredients total. I love the idea of seasonal menus and her guacamole tostadas caught my eye, especially since these roasted vegetable tostadas are one of our favorite meals! When I looked at the ingredient list I knew I had some of what I needed and figured I could make substitutions for what I didn’t (i.e. black beans instead of kidney beans). It wasn’t until I set out to make dinner that I realized my cabinet and fridge were barer than I thought. Rather than postpone my plan until I had a chance to hit the grocery store, I decided to make do with what I did have on hand. The end result was a mishmash of the original recipe. I kept the guacamole and the fried egg, but added a layer of mashed sweet potatoes and a sprinkle of feta cheese. Unsure of whether it would all work together, I placed it in front of Ryan and hoped for the best. I shouldn’t have been surprised that he (and I!) loved this. 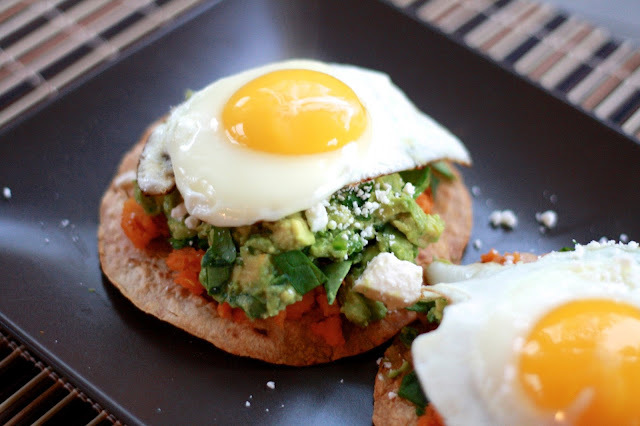 Neither of us is picky, but this also included several of our favorites: sweet potatoes, avocados, and fried eggs! These look pretty on the plate but I definitely mashed it all up in a bowl to eat to ensure I got a taste of everything with each bite. Sweet potato haters (ahem-Julia!) 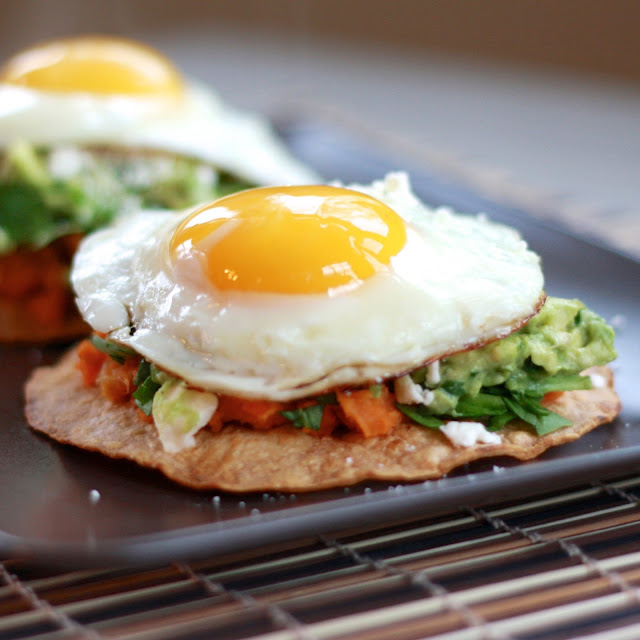 can definitely revert to the original recipe and top the tostadas with black beans, but I don’t think I’ll be straying too far from this new variation! 1. Preheat the oven to 400F. Brush the tortillas with olive oil on both sides and place on a baking sheet. Bake, turning once, for 6 minutes or until browned. Remove and set aside. 2. Cook eggs as desired (over easy was great!) and season with salt and pepper. 3. 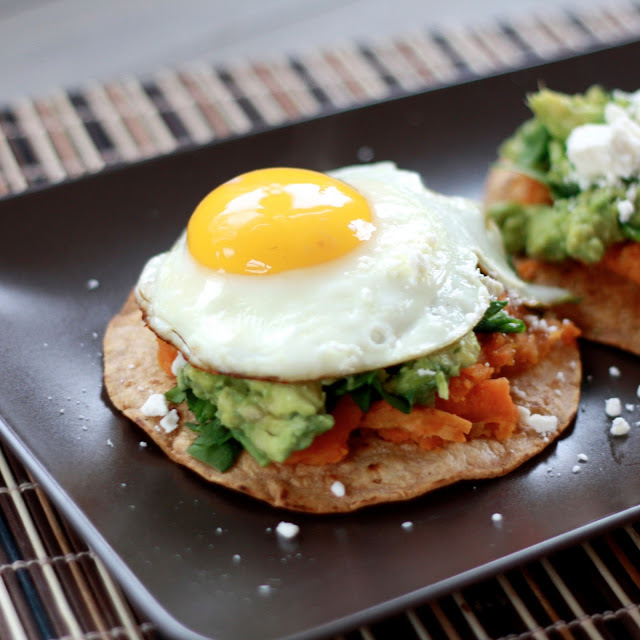 Top tortillas with mashed sweet potato. Sprinkle spinach over potato and top with guacamole and feta. Finish with egg on top. Serve immediately.